As promised, I just had to share more of the fun new trends in wedding flowers in 2011 including unique textures, muted color palettes and creative embellishment. 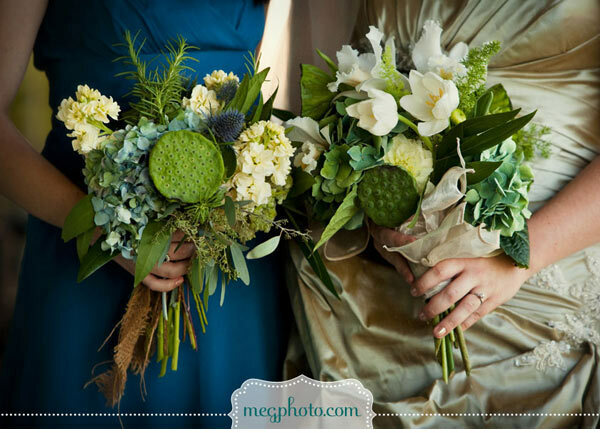 Pairing soft, romantic blooms with textural elements will give any bouquet an unexpected twist. In 2011, natural stems such as pods, succulents, and herbs are emerging as a fast growing trend. These organic stems bring dimension and interest to any bouquet. Pairing these elements with grasses, birch bark, and moss can also create a soft, ethereal vibe for your decor. Below is a perfect example which I found at signatureweddings.asia which was photographed by Meg Baisden. Another emerging trend for 2011 is tones that are more neutral. 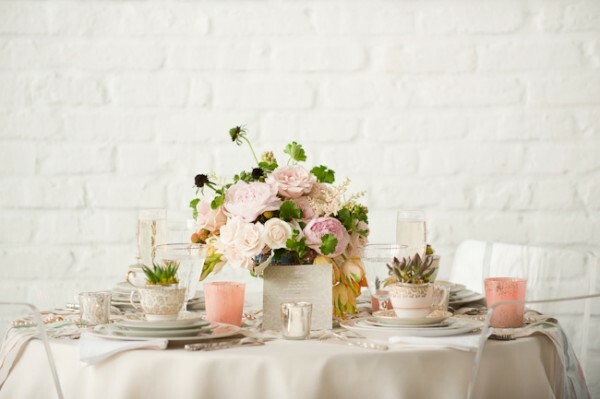 Brides are opting for earthy shades and blush hues for their color schemes. Pairing taupes or grays with contrasting soft pinks and mauves will reflect this year’s style. Another concept is using a single color in multiple shades to create a truly unique look. Whatever your color palette, remember this year it is about keeping it simple. Here is a sneak peek of a perfect example of a simple, yet elegant muted color palette from The Sweetest Occasion, which you have take a look at their whole Pretty + Understated Wedding Luxury post. To complete the 2011 wedding trends it is important to remember it is all about the details. This year, brides are opting to add embellishments such as buttons and vintage broaches to their bouquets to give it an extra creative element. Wrapping the floral stems in satin is always a timeless choice, but, using a piece from your mother’s wedding gown can add a personal touch. 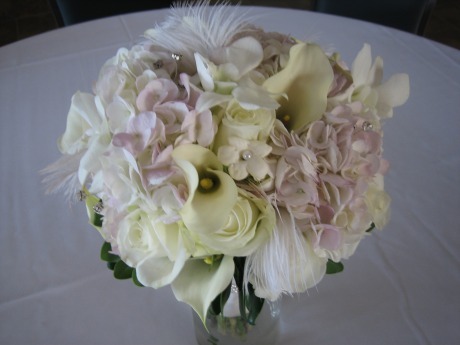 The use of embellishments will give your bouquet an extra finishing touch, creating a lasting memory for your big day. Below is a perfect example of this when a recent bride of mine chose to incorporate feathers, crystals and pearls into her bridal bouquet. How fun is that! Posted in Wedding Flowers and tagged 2011 wedding trends, bridal bouquet, floral design, sioux falls flowers, sioux falls wedding florist, sioux falls wedding flowers, sioux falls weddings, south dakota florist, south dakota weddings, wedding centerpieces, wedding florist, wedding flowers, wedding inspiration.